Brain monitoring monitors the activities associated with the functioning of brain like blood flow, electrical motion, and magnetic movement, gravity adjoining the brain, cerebral oxygen capacity, tumor and other conditions. These brain disorders can also lead to various symptoms such as paralysis, loss of sensation, tremors, muscle weakness and pain. The disease related to brain are complicated and the cost for the treatment and therapy is very high. To combat these diseases various number of Brain monitoring devices are available now-a-days. These devices monitor wide range of brain functions. Brain monitoring devices are incorporated extensively in hospitals and clinics. 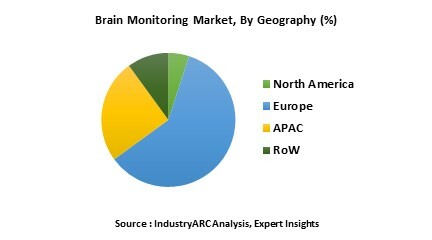 The Brain monitoring market is anticipated to see an upsurge in the near future owing to escalating rate of occurrences for brain disorders, sleep disorders and neurological disorders. Major factors owing to the growth in the brain monitoring market are the rising awareness about neurodegenerative diseases and technological advancements in devices. On the contrary the factors that hamper the evolution of this market are lack of trained professionals and high price of these intricate devices. Brain monitoring market is categorized based on the procedures being used, which can be further split as invasive and non-invasive procedures. Further the market is also segmented based on the device types being used in the market. MRI, CT, PET, EEG, MEG are some of the majorly used devices. Brain monitoring devices are used for testing, monitoring analyzing various therapeutic diseases like dementia, epilepsy, Parkinson’s disease, Huntington’s disease and many others. North America in 2015 held the largest share and is projected to see a major surge in the demand for brain monitoring during the forecast period, attributed mainly due to the growing occurrences of brain disorders in this region. The growth prospect of North America is followed by Europe. Though Asia will not have the majority share but is poised to witness the highest growth accredited to factors such as increasing aging population, availability of low cost labor and skilled man power, increase in disposable incomes and increasing government emphasis on health care reforms in this region. Siemens Healthcare (Germany) to name a few among others. 12.9. CAS Medial Systems, Inc.
12.10. Advanced Brain Monitoring, Inc.